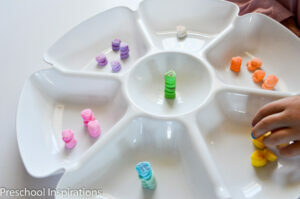 We are huge fans of candy games here, and I am so excited about this one! 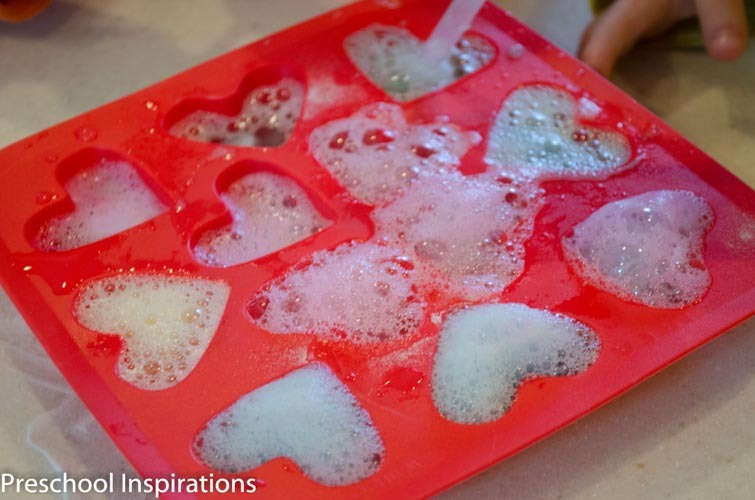 Last year, we did a Valentine’s Heart Fizzy Painting project from Gift of Curiosity , and I just had to do another fizzing science experiment this year too. 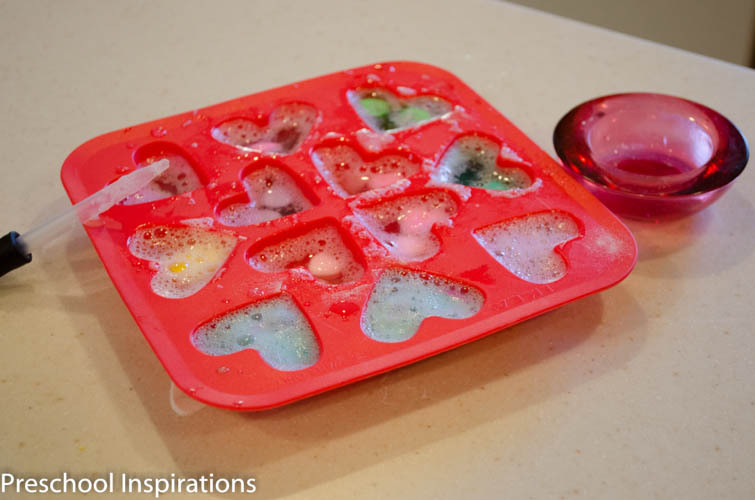 This time I wanted to use my heart ice cube tray from IKEA to add some extra Valentine’s Day vibes. This science project turned out just the way I envisioned it…the first try. That in itself is a huge accomplishment in the world of science! 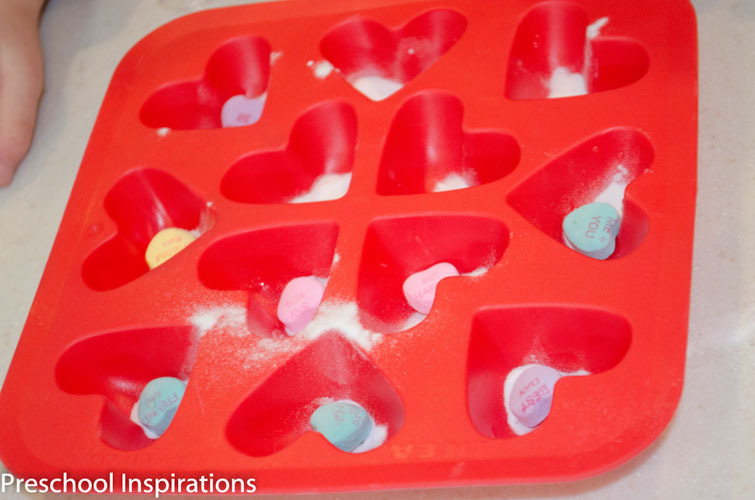 So here it is, our super cool candy heart fizzing science project. Try to say that five times fast! 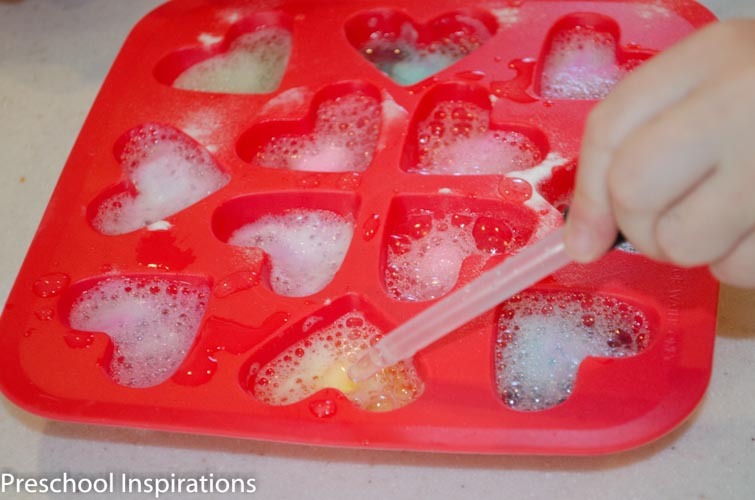 Here’s how to do your own awesome candy heart fizzing science project, with just a package of Sweethearts and two household ingredients: vinegar and baking soda. My two preschoolers did this entire project themselves, and I just made my services available to provide vinegar refills. 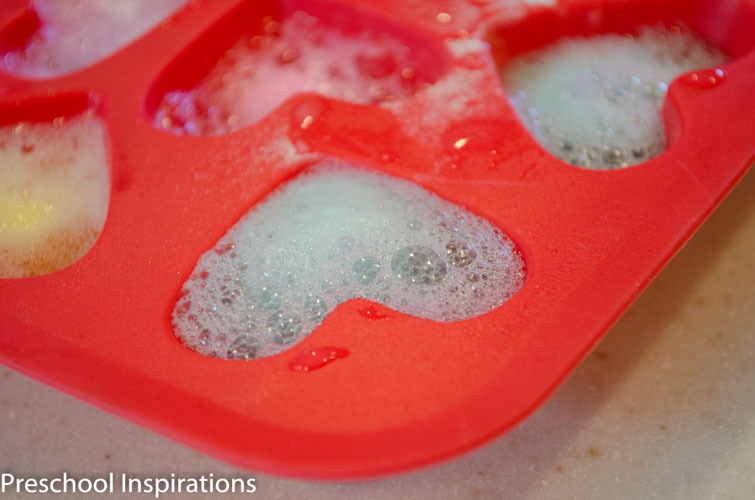 Begin by adding baking soda to your container. 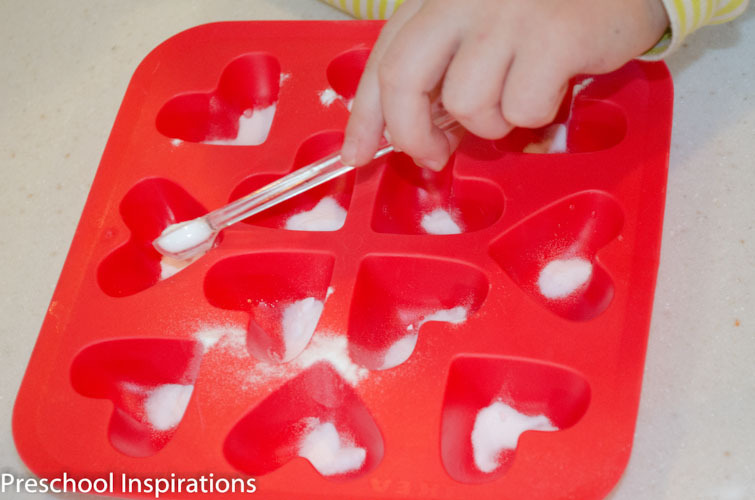 These hearts are small, so we used 1/8 to 1/4 a tsp of baking soda. Feel free to vary it because this project allows for a lot of flexibility. My 4 year old, Sugar and Spice, was left to all the measuring, and it was nice not to have to stress over exact measurements. 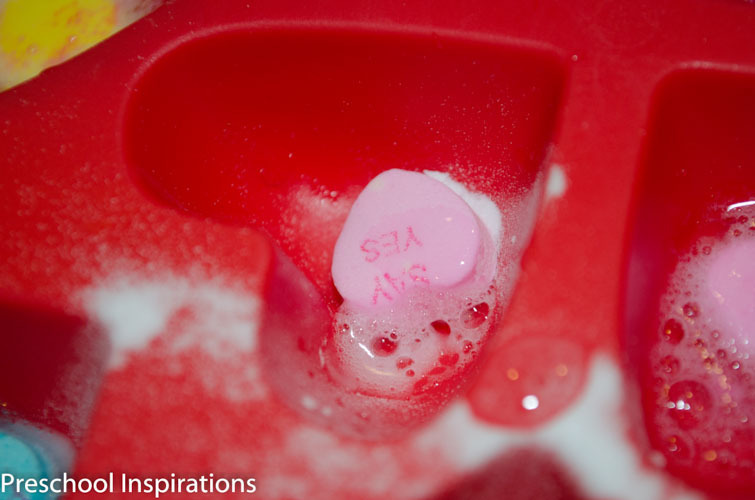 Next, add the candy hearts. Then it’s time for vinegar. This is where all the fizzing fun begins! Again, there are no exact measurements needed. Just let them enjoy squirting to their heart’s content. 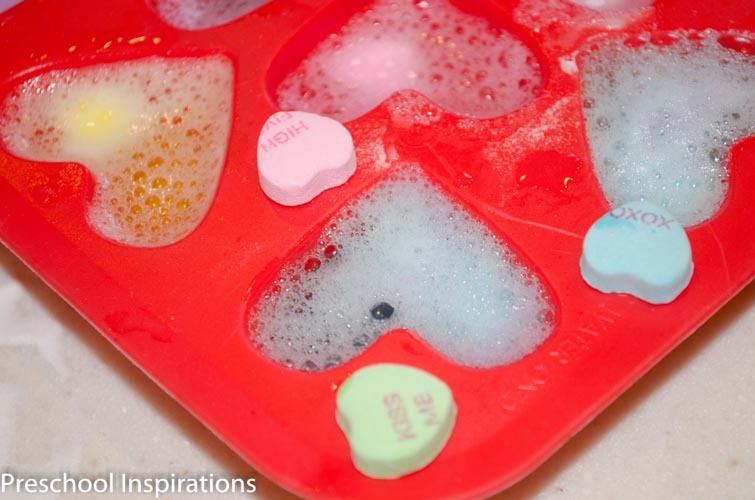 …until 20 minutes has passed and you all are still loving the candy heart fizzing goodness. Once the fizzing has stopped, you can stir it to get the wonderful bubbles going again. Of course you can always add more baking soda too. I was so thrilled with this, and both Sugar and Spice and Lil’ Red can’t wait to do it again! I love the simple and easy that turn out to be fun and magnificent! This is a great idea that will keep kids interested and learning! Thanks, Jill! It is always a pleasure to have you by! Isn’t anything fizzy super fun, Emma! I hope you all can have lots of enjoyment trying this out :). Oh, what a GREAT idea!!!! 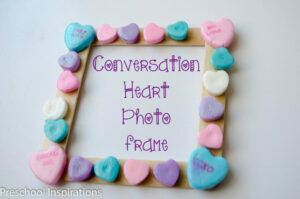 We will definitely do this sometime this week and add it to our conversation heart science experiments!!!!! Thank you so much, Ayn! It is so wonderful to have you visit. I hope you all have a blast trying this out :). FUN! My little guy is all about fizzing chemistry experiments right now. Will have to give this a try! Thanks for sharing!